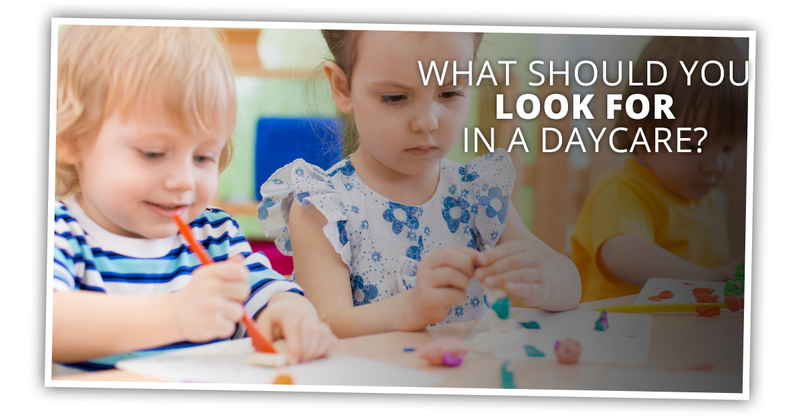 Choosing a daycare program or preschool for your child is a huge decision. Many parents and families stress over this because they understandably want their children to have the best possible start in life. At Growing Kids Learning Center, we acknowledge how difficult this decision is. Our preschool and child care teachers have compiled a list of things for you to consider when looking into programs for your young one. While we know that our preschool and daycare center is an exceptional place for every child to grow, we believe families should make informed decisions that they feel confident in. 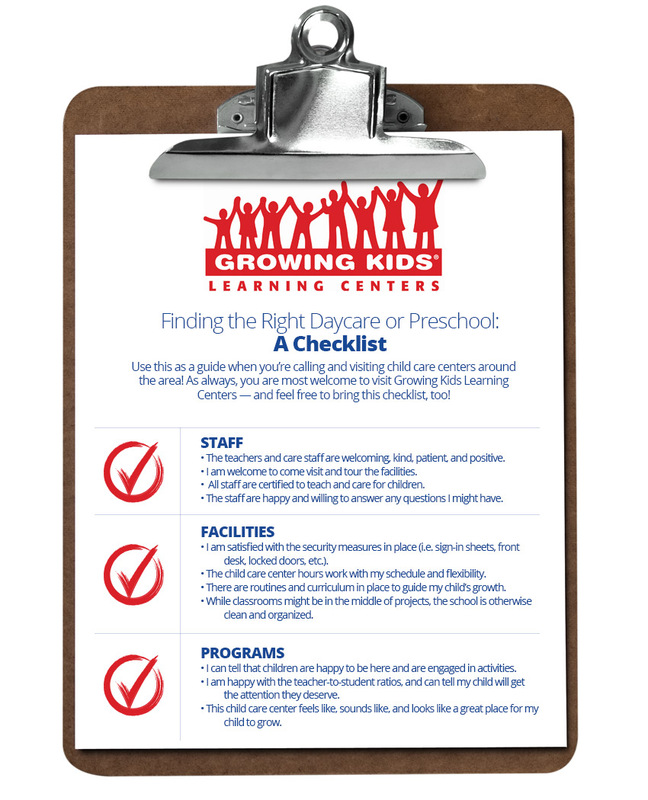 Whether it’s with us or elsewhere, we hope this guiding list helps you choose an incredible daycare or preschool program for your child! Find out more from Growing Kids Learning Centers, and visit one of our locations in South Bend (at Ireland Road, State Road 23, and North Bendix Drive), Elkhart, Valparaiso, Chesterton, Goshen, Warsaw, or Bristol today. What is the overall look? When you’re touring daycare and child care facilities, first impressions are everything. You’ll immediately get a sense of there being a possibility for this school or not from the moment you enter the building and start walking around. Are things kept pretty tidy? Are there good security measures in place? Are staff happy to greet you and answer any questions you have? Are children engaged in learning or play activities? These are some of the first things you’ll pick up on, and if you don’t like what you see, that’s a pretty good indicator that this is not the daycare facility for your family to consider. What sounds am I hearing? This might seem like a strange question to ask, but it’s a very important one. It’s something that you’ll intuitively do, but when you’re intentionally thinking about the sounds that you’re picking up on, you’ll be able to make a more informed decision about your child’s potential daycare or preschool. For example, do you hear child voices? Are teachers doing all the talking? If it’s silent, is there nap time? What are the tones in voices that you’re picking up on? How are adults talking to children and other adults, and how are children talking to adults and other children? Take all these things into account as you’re making your decision. How do I feel when I’m here? If you don’t feel comfortable at a daycare or preschool facility, you probably won’t want to send your child there. The right child care center should feel like a growing and learning environment. It should feel positive and uplifting, and a place where young ones can truly thrive. Ultimately, your intuition is crucial for making your decision. As a parent or guardian, you know your child best, and you should trust your gut about the daycare or preschool you’re looking into. If you send your young one to a place you’re not comfortable with, you’ll feel even more stress than trying to find the right daycare to begin with. You shouldn’t send your child somewhere that makes you feel uneasy or defensive. If those are the feelings you’re getting, it’s best to say “thank you for your time!” and look into another option. Choosing a daycare or preschool program can be stressful, but we know that you’ll find the right place for your young one. As tough as the search can be, it’s the kind of thing where once you’ve found the right place, you’ll have lasting relief and satisfaction. The search to find the right daycare is absolutely worth it! Growing Kids Learning Centers is happy to have you tour our school or ask any questions that are on your mind. Contact us to see if we’d be a good fit for your family!